Hardcover, half-linen, 96 pages, 17.0 x 24.0 cm, 6.7 x 9.4 in. "Life is so good!" she jubilated and flew right out into the middle of it. 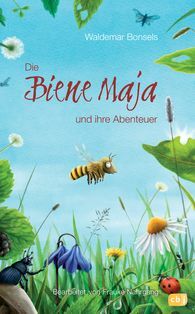 No sooner had Maya, the little baby bee, hatched out than there is no holding her back; in the beehive it's all just too boring for words – Maya can't wait to go out and meet the big, wide world! In the process, she not only makes the acquaintance of a nice rose beetle called Peppi and an off-beat grasshopper, but also has to be freed by dung beetle Kurt from the clutches of the villainous spider, Thekla. Then Maya learns of the nasty plan concocted by the hornets to attack the beehive! Maya simply must warn the others – and flies right into the middle of an adventure.